A brief guide and starting point to explore the mission and freedom of innovation labs. As part of a new project funded by Making All Voices Count, Results for Development’s governance team is exploring how technology innovation hubs in Africa are engaging with local policymakers and whether these interactions influence the co-creation of government policies and solutions. There are many possible answers to this question. Hubs are one embodiment of the “lab” universe, a huge conceptual space filled with incubators and accelerators, action labs and living labs, combinators and co-working spaces. What all of these spaces share is that they are innovation labs bringing technological know-how and entrepreneurial energy to problem-solving. A lab “creates a dialogue, listening carefully…to all the voices, and then tries to translate them, mix them, and amplify them to prototype and develop alternatives” (Labcraft). Labs have value, according to UNICEF’s guide, because they bring together diverse stakeholders, lower barriers to solutions from co-creators, are embedded in their local context, and encourage collaboration through shared physical space. However, strongly divergent opinions exist on this last issue of physical co-location. Some argue that literally rubbing shoulders is necessary for the magic of labs to flourish (Bridgespan et al., 2014; GIZ, 2012), while others downplay its importance (Sailer, 2015; Bloom and Faulkner, 2015). Some even seem hostile to funders “enamoured with… curvy furniture and futuristic displays” (Quaggiotti, 2014). Our research embraces the consensus that a successful lab will build adiverse, networked community around a core, intentional, well-designed space (Toivonen and Friederici, 2015; Labcraft; InfoDev, 2014). Curvy furniture isn’t necessary — “you can just meet under a tree” (Bloom and Faulkner, 2015) as long as, at least some of the time, innovators engage with each other via in-person “creative clashes” (Toivonen and Friederici, 2015). With this admittedly broad starting point, we can now try to conceptualize the different types of labs, in order to place our research within the broader universe and bounding that universe on a few continuua. It’s important to note, however, that these are not hard and fast separations, and most labs will blur most of the following lines (Toivonen, 2015). Still, we consider them useful heuristics. Continuum 1: Is the goal of the lab viable commercial market innovations or innovative social impact? Business-focused labs are commercial “accelerators” or “incubators” often backed by for-profit investors looking for significant returns. Incubators have to be selective in their acceptance of tenants, initiatives, or participants, because the selected projects receive a highly structured support program and then ‘graduate’ to survive or fail in the marketplace (Friederici, 2015a;Roberts et al., 2016). Incubators therefore measure their success through the quantity or quality of viable startups created (Friderici, 2015a; Friederici, 2015b; Labcraft). Hubs, on the other hand, tend to be broader and more open with a strong orientation on networking an internal community for larger positive social change (Friederici, 2015a). They can still be for-profit, but they explicitly focus on social innovation, usually to generate knowledge or provide services to impact lives (Bridgespan et al., 2014) through human-centered development, community empowerment, and other difficult to measure concepts without directly contributing to market-based measures (Jimenez Cisneros and Y. Zheng, forthcoming; Bloom and Faulkner, 2015). Continuum 2: How much programmatic freedom does the lab have? On the less independent side are those labs that are financially or physically dependent on a primary partner who takes a heavy hand in the lab’s programming (Bloom and Faulkner, 2015; UN Global Pulse, 2013). These can include “social impact hubs” or others sponsored by universities or public entities that hinder the labs’ ability to adapt and innovate (InfoDev, 2014), force them to “innovate within the box” (Toivonen, 2015), or drive a focus just on winning government tenders (Bridgespan et al., 2014; Infodev, 2014). Or they may may be philanthropically-supported labs that—depending on the mix of grant-funding and core support—end up “labwashed”, responding to donor wishes rather than local, mission-specific needs (Labcraft). This category could also include market-oriented labs anchored to a major partner or private firm (Labcraft; Gathege and Moraa, 2013) that, while invested in the entrepreneurial success of the lab, domineeringly shapes the hub’s work (Labcraft; Gathege and Moraa, 2013). 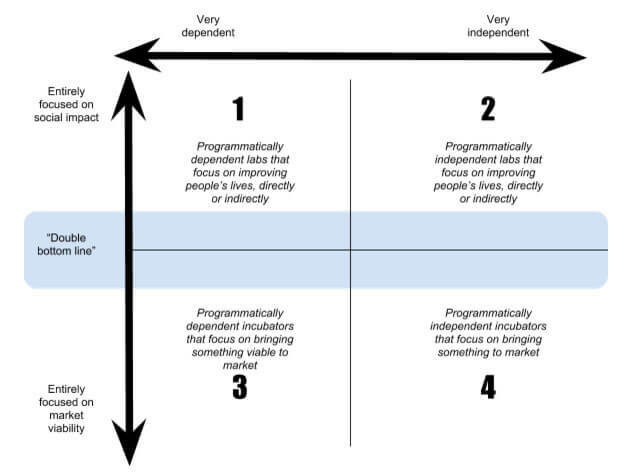 So, now we have business versus social orientation, plus degree of programmatic independence. With those two spectra, we can produce a matrix. In our research, we will be focusing on tech innovation hubs with some level of interaction with policymakers and some element of social impact. Cartographically, then, the hubs we research will most likely fall in Quadrants 1 and 2, as well as the double bottom line parts of Quadrants 3 and 4. And while we have not yet decided which real-world hubs we will focus on, it would perhaps be useful to close with a quick map of a few actual examples. Disclaimer: This is quick, dirty, and not perfectly scientific. 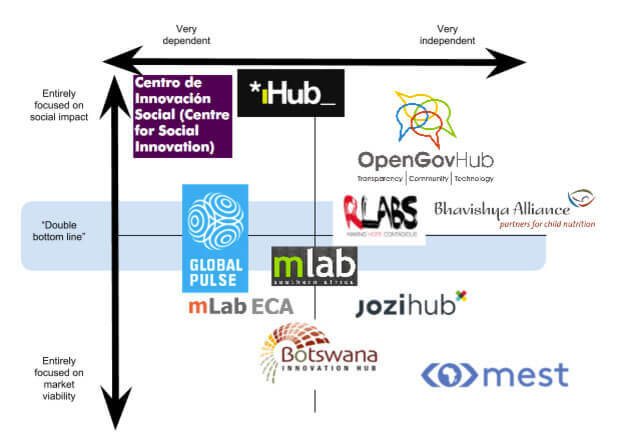 (If you want to find out more about the hubs above, please see: Bhavishaya Alliance, Botswana Innovation Hub, Centro de Innovación Social, iHub Kenya, Jozihub, Open Gov Hub, MEST Ghana, mLab ECA, mLab Southern Africa, RLabs, and UN Global Pulse Labs). Lab design do’s and don’ts, for potential hub founders, acceleration programs, donors and supporters, public sponsors, or all of the above. We hope with this project to contribute to these insights by shining some light on the as yet unclear relationships between tech innovation hubs, policymakers, and policymaking. Are we missing anything? Did you just write an awesome report that might be relevant for our work? Do you (dis)agree with our typology? Feel free to shoot me an email at pwhitt@r4d.org, or add a comment below to let me know.